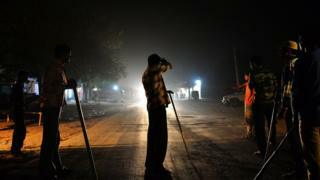 Police in the the northern Indian state of Rajasthan are investigating the death of a Muslim man at the hands of a suspected cow vigilante group. Police officials told the BBC that some men had attacked three vehicles that were transporting cows on Saturday. Five people were taken to hospital after suffering injuries in the attack, and one of them died on Tuesday night. The cow is considered sacred by Hindus, and killing the animal is illegal in several states, including Rajasthan. Senior officer Parmal Gurjar told the BBC that the police had registered a murder case against unknown people after the death of a man identified as Pehlu Khan. "We are checking video footage to identify the attackers. It seems they were part of a a cow vigilante group," he said. Mr Khan's uncle, Husain Khan, told the BBC that his nephew was not a butcher but a cattle farmer, and he had bought the cows for his dairy business. Police have also seized the three vehicles, and registered a case against four people for illegally transporting cows. Many states have actively started enforcing bans on cow slaughter after the Hindu nationalist Bharatiya Janata Party formed India's federal government in 2014. The western state of Gujarat last month passed a law making the slaughter of cows punishable with life imprisonment. In addition to government bans, several vigilante groups who portray themselves as protectors of cows have also been active in several states. The groups routinely check vehicles and often beat up cattle traders. Prime Minister Narendra Modi last year criticised the vigilantes, saying such people made him "angry". However this has not stopped attacks against cattle traders.